Determines The Flexibility Of The Desired Change To Be Implemented In The Organization! Change Management System is to control the life cycle of all changes. As new innovations evolve in the world of IT, care should be taken that while executing the changes; are easily acknowledged by the users. Changes should be implemented in such a way that they cause least of disruption to the IT services. Incidents that are associated with changes are listed in the Change Management Project. Details of the incidents, category and priority of the changes, status of the change, technician assigned etc could be known with the help of Change Management Process. Once solutions have been derived for the changes, they are stored in the solution management module of help desk. Impact of the changes on the organization and the risk level is calculated with the help of solutions provided for the changes. List of problems and incidents related to the changes could be seen in ITIL Change Management. Details of the problems and incidents such as their IDs, category, priority etc are seen by the technician. Facility to add new tickets for the changes is also provided in the incident and problem management module of Help Desk. Reports are generated for Change Management System where all the details of the changes, audit history of the change, solutions provided by the technicians for the change and so on is included. Different format of reports such as tabular, matrix and chart could be made with the help of this Report module of Help Desk. 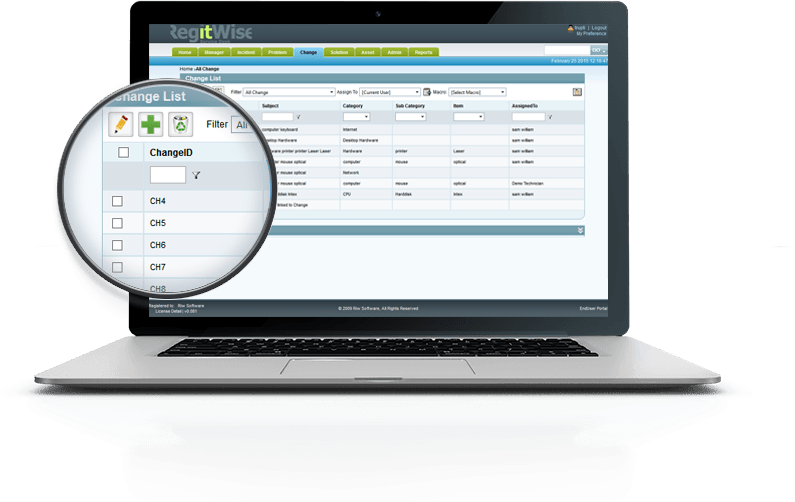 Statuses of the changes are checked by the technicians and admin with the help of this Change Management System. Notifications are sent to the users alerting them on the progress of the change request. 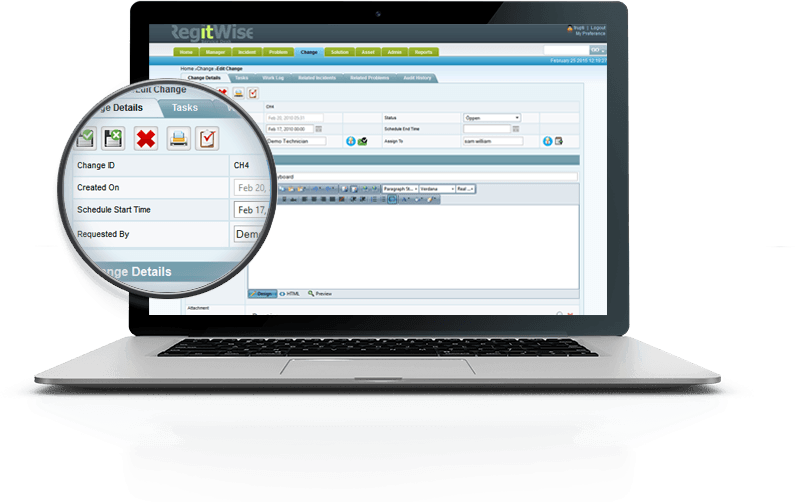 Facility to make predefined notification or alert templates for the changes is provided by RIW Help Desk. Why To Choose ITIL Ready Change Management System? The tasks to be performed to execute that are written in the work log of the change. Work log is considered as an activity planner for the changes. The time duration needed to complete the change, technicians assigned and the time duration spent to make the changes are all determined with the help of Change workflow. This Board consists of the stakeholders who will approve the changes that are required for the better working of a system. These stakeholders have all the rights to approve or disapprove a particular change. They are experienced and have well-versed knowledge in the Change Management Project. Emergency CAB’s also consists of few members who will be consulted in case of any emergency that occurs due to Change Management Process. Change Management System involves many people from the organization, each having their own role of making changes in the system. Change roles included the defined roles and the customized roles. These change roles will also require access permissions from ITIL Change Management for its implementation in the system. All the related requests will be considered by the change management module for implementing any change in the system. Change Status is a kind of notification for any change request that is made. This status notifies if the request made is approved, in waiting, rejected and so on. The change status will be notified to the user and will also be recorded in the ITIL module before the requests made by the users. This is an important feature of change management module since it will inform the user about the outcome from the management regarding the aforesaid requests. Satisfied Customers of RegitWise Service Desk !!! 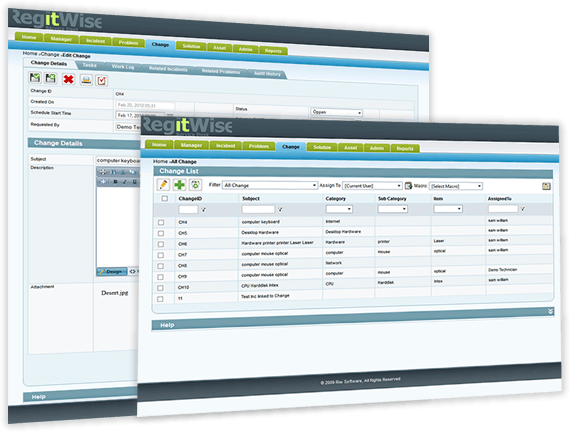 Check out the excellent services and best quality products given by RegitWise Service Desk. Try the 30 days free trial and get accustomed with RIW Service Desk.